It's October 2006. In a few months, Romania will join the European Union. Meanwhile, the northern Italian town of Turin has been rocked by a series of crimes involving Albanians and Romanians. Is this the latest eruption of a clan feud dating back centuries, or is the trouble being incited by local organized crime syndicates who routinely "infect" neighborhoods and then "cleanse" them in order to earn big on property developments? Enzo Laganà, born in Turin to Southern Italian parents, is a journalist with a wry sense of humor who is determined to get to the bottom of this crime wave. But before he can do so, he has to settle a thorny issue concerning Gino, a small pig belonging to his Nigerian neighbor, Joseph. Who brought the pig to the neighborhood mosque? And for heaven's sake, why? 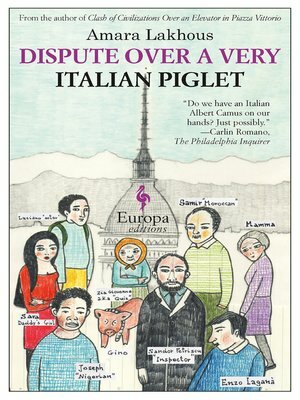 This multiethnic mystery from the author of Clash of Civilizations over an Elevator in Piazza Vittorio pays homage to the cinematic tradition of the commedia all'italiana as it lightheartedly probes the challenges and joys of life in a newly multicultural society.